The picnic will be held from Noon - 2:00 PM on Saturday, May 25, 2019. The location is Prescott's Goldwater Lake Park at the Lakeview Pavilion. PCS will pay the $3 parking fee for the first 25 cars that show up. Please note that you must mention something like "I'm with the Prescott Computer Society" or "the computer club" to the attendant at the entry station in order to receive your parking pass. To expedite the process and save tickets for others, you are encouraged to carpool. The Goldwater Lake Park is a confusing location - it's easy to drive around the park, miss the signage and find yourself back at the exit. Please check the map and look for the temporary PCS signs directing you to the event. If you have gone too far, just re-enter the park and try again. You may bring your own beer but nothing stronger. PCS will provide chicken from Fry's, soft drinks, plates, napkins, etc. Please bring a dish to share. This may be a salad, dessert, side dish or entree. From Gurley Street in Prescott, proceed 3.2 miles out Senator Highway. 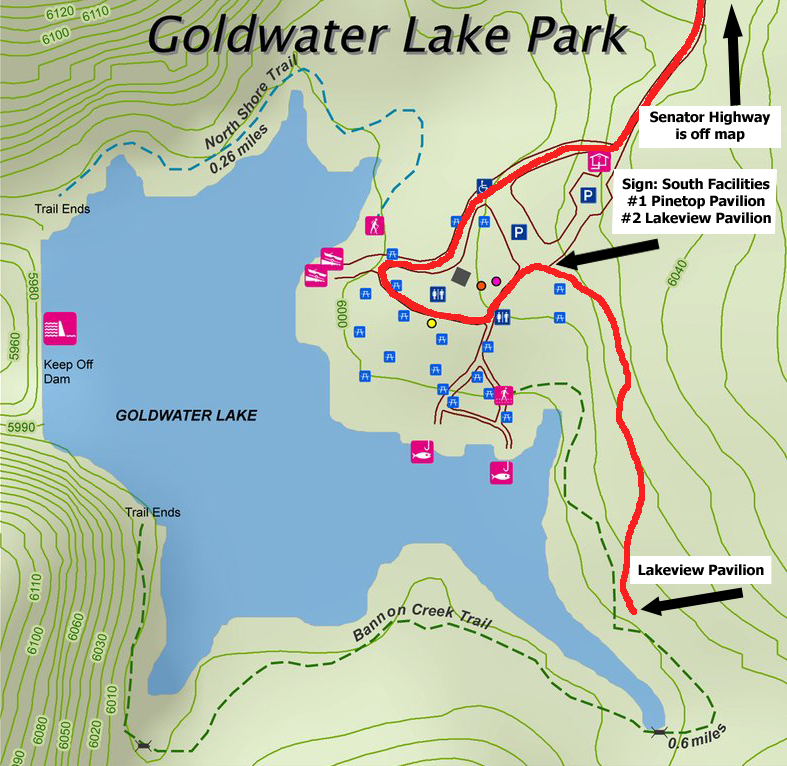 A sign on the right will inform you (in just enough time) that "Goldwater Lake Next Right". Once you enter, you'll have to drive almost all the way around the park until you see a turnoff to the right for the Lakeview Pavilion. We will try to have PCS signage installed, so look for those too. Take that road until almost the end. The pavilion will be on your right.